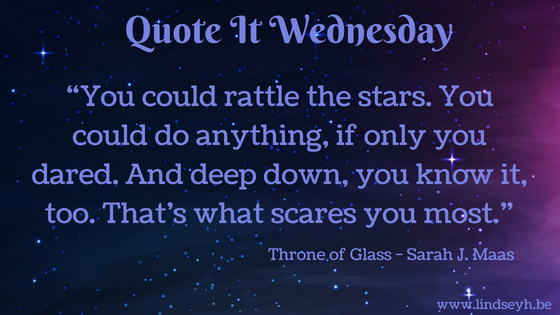 Hi everybody and welcome to a new Quote It Wednesday! Today’s quote is one of my all-time favorite motivational quotes. I don’t know why, but there is just something about the phrase ‘rattle the stars’ that gets me all fired up. Don’t just settle for reaching the stars. RATTLE the stars. I’m not gonna lie, I’ve even thought about getting this quote as a tattoo someday. Plus I love the next sentence because really, don’t we all get a little scared of actually reaching our goals sometimes? I mean, yes failing is scary, but so is actually reaching our goals and getting everything we dreamed about. Because then what? WHAT DO YOU THINK OF THIS QUOTE? Does it motivate you? Are there any motivational bookish quotes you’ve ever thought about getting tattooed? It would make a great tattoo, I so agree 😉 Haha, yes buying the bookish merch is a close second though! One of my favorite quotes from the book. It is definitely inspirational!